Creating a Little Mermaid bedroom for your daughter is a lot of fun and something you can either do by yourself to surprise her with or with her 'help'. The Little Mermaid is a change from the other Disney Princesses as you can explore under the sea as well which is something I love about Ariel. Disney Princess Ariel is better known as the Little Mermaid and was my eldest niece’s favorite Disney Princess. She’s much too old for a Little Mermaid bedroom now (she’s now really old – a teen! 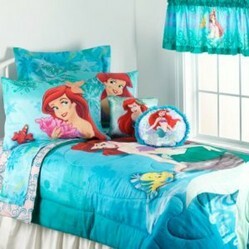 ), but I can still remember how thrilled she was when I found a Little Mermaid sheet set for her. Creating a great Disney Princess bedroom can be done by simply adding the appropriate bedding or by adding absolutely everything along the same theme. A friend of mine who is handy with a paint brush has even added under the sea flourishing touches for a Little Mermaid bedroom for her daughter. Personally I’m not that good with a paint brush so I would start with plain walls (which are also easier to update when your little girl wearies of Ariel) and use some of the following things to transform your daughter’s bedroom into her very own realm. Before you even step into this magic realm that you’ve created the door should adorn a sign to give a little indication as to what awaits the subjects inside. In my experience children love having signs on their door as well and this Little Mermaid sign works really well as you can personalize it for your own little princess. The first thing I notice when I enter my daughter’s bedroom is her bed, now when it comes to beds I usually recommend getting a neutral bed either wood or (my personal favorite) white and use the bedding to add impact to the room. You can use Little Mermaid sheets, comforters and throws to decorate your daughter's bed or you can just use one of these items. Some people just have Little Mermaid sheets and a plain comforter/duvet cover to match and this can give your daughter a nice surprise as she gets into bed. The most common combination however is to have plain sheets and a Little Mermaid comforter or duver set on the bed and I've included a cool turquoise comforter set opposite which I think looks awesome! With my daughter I've started to just use a throw blanket - she has plain sheets and plain comforters and can put her throw blanket on to show off what she's into at that point of time. This certainly makes it easier when they decide that the Little Mermaid is for babies and they're a big girl now as you can simply whip the throw off of the bed and they still have sheets and comforters to use! Now as I’ve mentioned if you’re handy with a paint brush you could paint an underwater world for your little girl, but this can be quite a major overhaul when she grows out of her Princess Ariel spell.....and unfortunately she will. I find that using wall stickers are a great way of decorating the walls with the added bonus that you can just peel them off when she turns her attention towards Bratz or Hannah Montana! Another way of adding wow factor to a Little Mermaid room is by adding switchplate and outlet covers in Princess Ariel designs. The amount of wow for your buck with these finishing touches is really good. It’s a little like adding icing onto a cake. My daughter doesn’t have a fan in her room instead she had a light with a rather plain lightshade. When we first moved into this house we didn’t have the money to decorate her room (the paint was pretty good and in colors she liked anyway). What I did do was to take some beading wire and pop some cheap beads in different colors onto the wire and I glued it around the bottom of the lightshade in a scalloped fashion with beads hanging down. It looked like a princess’ necklace according to my daughter at the time. For Princess Ariel I think you would have to use ‘pretend’ pearls which you can pick up really cheaply and in a variety of colors. 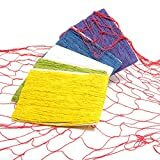 If you wanted to involve your own little mermaid princess in the décor of her room you could get her to help you by threading on the beads – this is also great for developing her fine motor skills. If you have a fan in your daughter’s room you can decorate it with Little Mermaid stickers which add a fun element to the room and something she can look at when she’s lying in bed. It’s actually a great trick to get her to lie still when you know she’s tired and see if she can count how many stickers there are…….it doesn’t always work, but lots of times it results in them falling asleep without any whining!! Adding a fish net to the ceiling in the corner of the room is a great idea for extra storage in the room. This is especially good when your little girl has lots of stuffed toys that she wants to keep, but doesn’t play with very often. Pop them up in the net and they can ‘keep an eye on her’ and they’re not cluttering up the rest of the room. I’m not sure who said it, but I’ve heard someone say that windows are like the eyes of a room and it’s so true. If you have a plain window with no curtain, blind, valance etc then your eyes are drawn to it and it doesn’t matter how nicely decorated the room is you’re left feeling that it’s incomplete. At the moment I can't find any Little Mermaid curtains for sale online, but you could keep a regular check on your local stores or even eBay and you might get lucky. Of course you could just use plain curtains in a complimentary color or blinds and just add a Little Mermaid valance and the effect would still be very nice. Even without a valance as long as you’ve picked out the colors that you’ve used in the room the windows will look great. Another way of accenting your windows is using window clings. Window clings add another dimension to the window and, for some reason, seem to be a huge hit with younger children! The great thing about window clings is that they are easy to remove and re-stick which means that your daughter can change them around when she feels like it. My daughter has never had a nightlight in her bedroom, but it appears that a lot of children like to have them and there are a few that feature Ariel. Personally I always feel that a bedroom is ‘unfinished’ if it doesn’t have a lamp of some description in it. I’ve managed to find a wonderful lamp (below) featuring the princess mermaid Ariel herself. Depending on how big your little girl’s bedroom is and whether or not you have built ins will make the decision as to how much furniture you need in her room. A table and chairs can be great as can a desk, comfy chair, bookcase and more. When my daughter was first born I brought a very plain chest of drawers and decorated the knobs with pooh bear designs, as she grew out of pooh I used other drawer knobs like the Disney Princesses and ten years later the same chest of drawers are still being used. 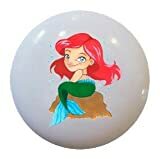 I’ve managed to find some Little Mermaid drawer knobs (opposite) in case you wanted to replicate that idea.